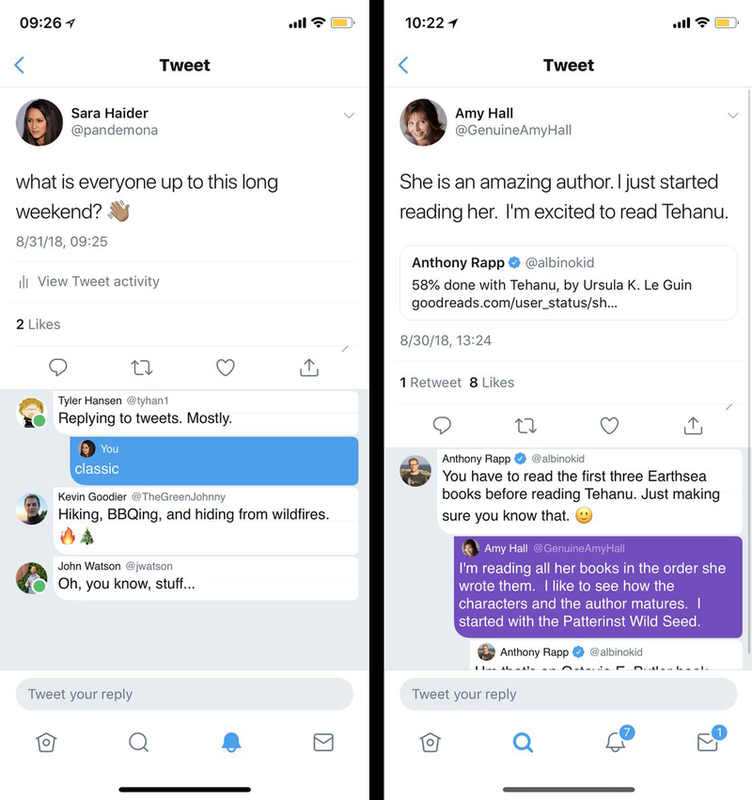 Twitter will be rolling out beta updates including “conversational”-style speech bubbles and indented/color-coded replies based on whether you follow another user in the coming weeks, the Verge reported on Wednesday. Other features under consideration, but which will not be available in the forthcoming beta, include green-colored status availability icons that might indicate whether a user is online. Screenshots posted by Twitter’s director of product management, Sara Haider, to the site illustrate what these changes like. Pretty much anyone who has already gone down the Twitter rabbit hole—something that as a longtime user of the platform I cannot, in all honesty, recommend—will be familiar with the competitor this looks almost exactly like: Facebook. Just, you know, cropped to leave out the hordes of neo-Nazis, trolls, and white supremacists that continue to flood Twitter. Once you see it, it’s hard to ignore. This looks like Facebook, except on Facebook you usually only have to put up with someone using the display name Reich_Daddy_420 if they’re your great aunt’s second cousin or venture into your private message requests or something. Another feature that could roll out in the future is “ice breaker” tweets, which are supposed to help start a conversation about a specific topic. Users would be able to post their own ice breakers for others to respond to. An additional feature would let people attach tags to their tweets that explained what they were in reference to, like a TV show. While Haider wrote in her tweet that the changes were intended to “make it feel more conversational here,” they also take the site further away from its original conception as a strictly linear flow of posts—somewhat along the lines of its much-maligned decision to inject algorithmically curated tweets into feeds. And conversations are all well and good, except if the one of the people having the conversation is you and the others are the aforementioned hordes of Reich_Daddies.